Palé Hall is a delightful discovery for discerning visitors – a lovingly restored Victorian country manor set in refreshingly tranquil and beautiful surroundings. Queen Victoria herself warmed to Palé’s welcome during her visit in 1889 and the present family owners are proud to maintain the Hall’s great tradition of hospitality. The elegance and grandeur of Palé remain unchanged, while the amenities have been discretely enhanced to the highest standards. We are sure Her Majesty would have approved. 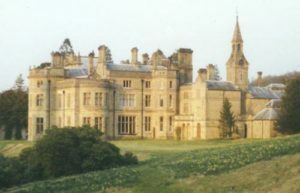 Completed in 1871 as the home of eminent railway engineer Henry Robertson, Palé Hall is one of the finest Victorian country houses in Wales, set in acres of parkland rolling down to the sporting River Dee. The public rooms are magnificent and comfortable, from the galleried entrance hall with its vaulted ceiling, to the Boudoir, with its hand painted dome and the marbled bar. Connoisseurs of craftsmanship will find much to enjoy in the Hall, including its fully-functioning hydro-electric plant, those who love stylish living will simply luxuriate in its atmosphere. Palé Hall is packed with delightful surprises for those visitors tired of anonymous corporate hotels. One might for example choose to sleep in the bed enjoyed by Queen Victoria and relax in her original royal bath. Each guest room is individually appointed with an extraordinary selection of beds and bathing facilities, private sitting rooms and commanding views on all sides. Dining at Palé Hall is stylish and restful, with the accent on fresh , natural foods and regularly changing menu, including special selections for vegetarian and other diets. The location of Palé Hall is one of Wales’ best kept secrets – an unspoilt area of lush valleys, gentle hills and nearby moorlands and mountains, which make it a paradise for outdoor enthusiasts of all types: from strolls in the landscaped hotel grounds, to fishing, shooting, horse riding and mountaineering, which are all nearby. Palé Hall is the ideal base for touring and exploring this most beautiful and crowd-free corner of Britain; and when the day is done, what finer haven could there be in which to relax and unwind? There is so much to enjoy at Palé Hall, whatever the season or the weather: taking tea on the manicured lawns in summer, or resting in front of a cracking log fire in winter. Whether staying on your own or in a party, you will find the service personal yet unobtrusive, attentive yet respecting your privacy. Palé Hall rekindles the best traditions of Britain’s great houses. Palé Hall is an astute choice for smaller conferences and group events, providing a location that allows users to focus on what they wish to achieve, undistracted by the concerns of everyday life. Facilities include a conference room configured for up to 22 people, syndicate rooms and a private dining room. The many outdoor activities available nearby are ideal for team-building and personal development programmes. From Chester take the A5104 towards Corwen. On the A5 turn right onto the B4401. Pass through Cynwyd and Llandrillo. Turn left onto B4402 and Palé Hall is situated on the right hand side.